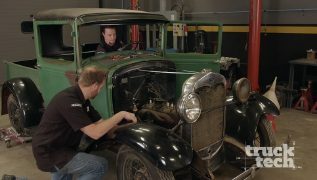 The guys give a sneak peak at projects for the upcoming season, along with showing how to start a barn find that has been sitting for a long time. 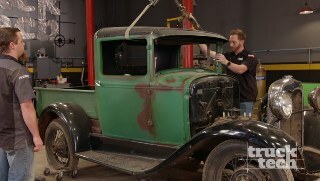 'Our '30 Model A cab and bed is removed from its 87 year old frame. Then the build can begin by putting the cab on the new frame, along with firewall modifications. Project "Klassy K5" gets its first coat of high build primer, then Jeremy and LT block it down smooth. 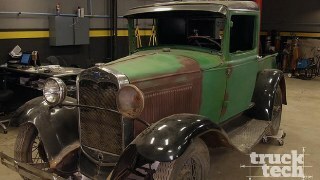 Then, they build some new shop equipment that will help us modify the frame of the 1930 Model A hot rod. 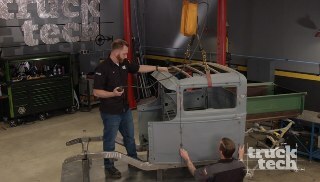 To get the '30 Ford street rod down to the ground, the guys cut the frame in half, drop it 8 inches then weld it back together all to get this chassis "sittin' in the weeds." 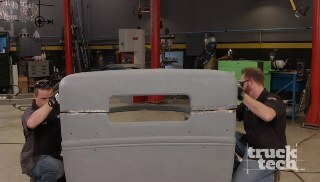 Jeremy and LT continue on the Model A project finishing up the drop by modifying the rear of the Pete & Jake's chassis. This custom hot rod truck will be slammed to the ground and with suspension to accommodate. (NARRATOR)>> SOMETHING BIG IS ABOUT TO MAKE ITS WAY IN BETWEEN THE FRAME RAILS OF OUR MODELA. PLUS THE LARGEST GATHERING OF CHEVY C-10'S ON THE PLANET IS HERE IN TEXAS. WE'LL TAKE YOU TO THE C-10 NATIONALS. THAT AND MORE RIGHT NOW ON TRUCK TECH. 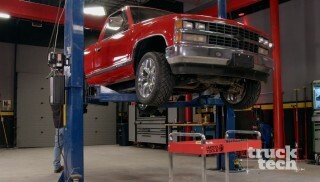 (LT)>> HEY GUYS, WELCOME TO TRUCK TECH, AND CHECK OUT WHAT WE'VE GOT IN THE SHOP TO WORK ON TODAY. (JEREMY)>> OUR 1930 FORD MODELA PICK UP. OUR VERSION OF A 1950 STREET ROD. 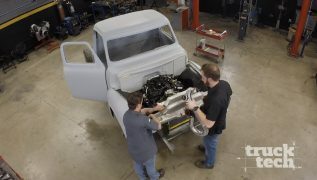 NOW WE HAVEN'T GOTTEN THIS MUCH POSITIVE FEEDBACK ON A BUILD SINCE OUR '71 PATINA C-10, WHICH YOU'LL SEE IN A LITTLE BIT, BUT WHAT DO YOU THINK ABOUT THE STANCE SO FAR? (LT)>> WELL I'M REALLY DIGGING IT. IT'S REALLY NICE AND LOW, BUT I THINK WE CAN GET AWAY WITH GOING A LITTLE BIT LOWER. PLUS WE STILL HAVE TO STRETCH THE CAB THAT FIVE INCHES. WE'VE FULLY ASSEMBLED THE CHASSIS INTO A ROLLER, AND BUILT SOME SUPPORT TUBES TO STRENGTHEN THE FRAME. (JEREMY)>> NOW WHEN IT CAME TO SELECTING A POWER PLANT FOR OUR CLASSIC STREET ROD THEY'RE OBVIOUSLY A TON OF OPTIONS OUT THERE. WE DID HAVE ONE RULE THOUGH. IT COULDN'T BE AN LS, SMALL BLOCK CHEVY, OR A WINDSOR FORD. WE WANTED THAT CLASSIC VIBE. WE WANTED TO GO OLD SCHOOL. SO WE DECIDED ON A 1961 BUICK NAIL HEAD. (LT)>> NOW THIS IS A 401 CUBIC INCH VEIGHT, AND DEPENDING ON WHAT TYPE OF CAR IT CAME IN THERE WERE A COUPLE OF DIFFERENT TORQUE RATINGS, AND THEY ALL GOT THE NICKNAME "WILDCAT". YOU COULD GET A 375, 410, OR 445. NOW THESE EARLY NAIL HEADS, THEY KIND OF HAD AN ODD SHAPED BELL HOUSING. IT'S NOT THE SAME AS THE LATER BUICK/OLDS/PONTIAC STYLE, AND OUR MOCK UP TRANS IS A CHEVY TURBO 350, AND THESE TWO WON'T BOLT TOGETHER. SO WE NEED SOME SORT OF A CONVERSION PLATE TO MAKE THAT HAPPEN. (JEREMY)>> WE CONTACTED BENTSEN'S SPEED GEMS IN MINNESOTA, AND THEY SENT US THIS ADAPTER KIT FOR THE '57 THROUGH '63 BUICK NAIL HEAD BUT THEY ALSO HAVE OTHER ADAPTERS FOR A WIDE RANGE OF VINTAGE ENGINES. THIS KIT WILL TAKE THE ODD EARLY YEAR BUICK BOLT PATTERN TO A STANDARD CHEVY PATTERN. SO WE CAN RUN JUST ABOUT ANY AUTOMATIC TRANSMISSION LIKE A 350, A TURBO 400, OR EVEN A 700-RFOUR WITH OVERDRIVE. THE KIT COMES COMPLETE WITH THE ADAPTER, THE FLEX PLATE, THE TORQUE CONVERTER DRIVE PLATE, THE SPACERS, AND EVEN THE ALIGNMENT DOWELS TO MAKE SURE WE KEEP EVERYTHING CENTERED. (LT)>> THE ADAPTER PLATE LINES UP WITH THE FACTORY DOWEL PINS, AND SOME CAP SCREWS ATTACH IT TO THE BLOCK. NEXT THE SMALLER SPACER GOES ONTO THE CRANK SHAFT, AND THE FLEX PLATE GOES ONTO THAT SPACER. THEN THE LARGER SPACER SANDWICHES THE FLEX PLATE, AND SOME MORE CAP SCREWS ATTACH EVERYTHING TO THE CRANK. THE CONVERTER DRIVE PLATE BOLTS ONTO THE REAR OF THE LARGE SPACER. (JEREMY)>> GO DOWN A LITTLE BIT, OVER HERE. DOWN A LITTLE BIT, THERE YOU GO! (LT)>> I'VE ALWAYS BEEN TOLD YOU'RE SUPPOSED TO JUST PUT A BOLT IN AND CRANK IT DOWN UNTIL YOU HEAR SOMETHING CRACK. (LT)>> MAYBE THAT'S WHY MY TRANSMISSIONS ALWAYS BLOW UP. (JEREMY)>> THINK SO? LET'S GO. (LT)>> WE'LL REMOVE THE CAB FROM THE FRAME TO GIVE US SOME MORE ROOM TO WORK, AND WE CAN LOWER THE ENGINE IN AND SEE WHAT WE'RE WORKING WITH. ALL RIGHT, WELL THE TRANSMISSION'S ABOUT AT A PRETTY GOOD HEIGHT RIGHT NOW, BUT THE FIREWALL, I MAY NEED TO SLID AHEAD. WHAT IT'S LOOKING LIKE UP HERE? (JEREMY)>> I THINK WE COULD STAND TO COME FORWARD JUST A LITTLE BIT. WE'VE GOT BASICALLY THREE CHANNELS IN THIS PULLEY HERE, AND WE'RE ONLY GONNA RUN ONE BELT. SO I MAY SEE IF I CAN YANK THIS OFF AND THEN COME FORWARD A LITTLE BIT. (LT)>> A LITTLE TIGHT AROUND THAT STEERING BOX, LET'S GO UP. (JEREMY)>> THAT'S A LOT BETTER. (LT)>> WHEN YOUR POSITION AN ENGINE INTO A BARE CHASSIS YOU WANT TO KEEP IT AS LOW AS POSSIBLE FOR A GOOD CENTER OF GRAVITY WHILE KEEPING GROUND CLEARANCE IN MIND SO THE OIL PAN WON'T GET DAMAGED ON SPEED BUMPS. IT ALSO NEEDS TO BE LEVEL, AND YOU WANT THE CRANK SHAFT AND TAIL SHAFT TO BE CENTERED IN THE FRAME. 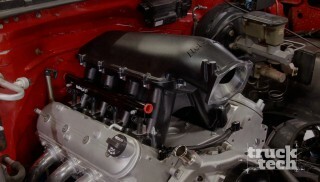 (JEREMY)>> ALL RIGHT, NOW THAT WE'VE GOT THE ENGINE WHERE WE WANT IT IT'S TIME TO FOCUS ON BUILDING SOME ENGINE MOUNTS. NOW WE COULD SOLID MOUNT THE ENGINE TO THE FRAME. I KNOW A LOT OF RACE CAR GUYS DO THAT, BUT IT'S NOT REALLY THE RIGHT WAY TO GO ABOUT IT ON A STREET DRIVEN TRUCK LIKE THIS. IT COULD CAUSE A LOT OF VIBRATION AND STRESS ON SOME PARTS. SO WE'RE GONNA SHOW YOU ANOTHER WAY TO DO IT. (LT)>> NOW THE FACTORY WILL MOUNT AN ENGINE IN A SOFT RUBBER MOUNT LIKE THIS. BOLTS TO THE SIDE OF THE BLOCK AND THE RUBBER ISOLATES THE ENGINE FROM THE CHASSIS, KEEPING EVERYTHING NICE AND QUIET AND VIBRATION FREE. WE'RE GONNA DO SOMETHING SIMILAR BUT INSTEAD WE'RE GONNA USE A POLYURETHANE LEAF SPRING BUSHING. WE'LL START OUT BY MAKING A PLATE THAT BOLTS TO THE BLOCK JUST LIKE THE FACTORY ONE DID AND BUILD A COUPLE OF TABS THAT ATTACH OUR BUSHING. (NARRATOR)>> NEXT, MOTOR MOUNTS MADE EASY. (LT)>> THIS GIVES PRECISE CUTS WITH MINIMAL CLEAN UP NEEDED. I'LL USE THE DRILL PRESS AND AN OLD ENGINE MOUNT AS A TEMPLATE TO DRILL THE PLATE. BY INSTALLING A NUT AND BOLT IN EACH HOLE AFTER I DRILL IT THE OLD MOUNT IS LOCKED IN PLACE, GIVING PERFECT ALIGNMENT OF THE BOLT HOLES. ALL RIGHT, BECAUSE OF THE TIGHT CLEARANCE AROUND THE STEERING BOX I NEED THE FRAME PART OF THE MOUNT TO BE AS CLOSE TO THE ENGINE PART OF THE MOUNT AS POSSIBLE, BUT IT'S GONNA GO RIGHT OVER ONE OF THE BOLTS THAT HOLDS THIS PLATE ONTO THE BLOCK, AND I DON'T WANT IT TO HIT. SO TO TRIM THE SIDE TAB AT THE RIGHT HEIGHT I'M GONNA LEAVE PROBABLY ABOUT AN EIGHTH OF INCH ROOM, MAKE MY MARK, AND THAT'S WHERE I'M GONNA CUT IT. TO MAKE THESE UNIVERSAL CHASSIS TABS WORK FOR US THEY JUST NEED A LITTLE TRIMMING IN THE CHOP SAW. I'LL ASSEMBLE THE WHOLE THING TOGETHER WITH THE BUSHING TO HOLD PROPER SPACER SO I CAN TACKED THE TABS ON THE PLATE. THEN THE MOUNT BOLTS TO THE BLOCK AND THE SLEEVE IS ATTACHED WITH A THROUGH BOLT. SO THE VERY LAST STEP TO COMPLETE THE MOTOR MOUNT ON THE DRIVER'S SIDE IS SOMEHOW TYING THIS SLEEVE TO THE FRAME RAIL. TO DO THAT I'M GONNA USE THE SAME TWO INCH OUTSIDE DIAMETER 190 WALL DOM TUBE THAT THE SLEEVE IS MADE FROM, AND THE FIRST STEP IS NOTCHING THE END SO IT BUTTS UP AGAINST THE SLEEVE. A TUBING NOTCHER IS AN ESSENTIAL TOOL TO HAVE IF YOU'RE DOING ANY TYPE OF CHASSIS OR ROLL CAGE WORK. A TWO INCH HOLE SAW MAKES THE PERFECT SIZE NOTCH. TO MAKE A PATTERN I'LL MAKE TWO PARALLEL LINES TWO INCH APART. MARK THE NOTCHED END AND CUT IT OUT WITH SCISSORS. I'LL MAKE A MARK WHERE THE TOP EDGE TOUCHES THE FRAME AND MAKE THE ANGLED CUT. SEE IF THAT WORKS. ON THE FIRST TEST FIT IT'S NOT QUITE WHERE I WANT IT. SO FAR IT'S PRETTY CLOSE BUT IT DOES SIT JUST A LITTLE BIT TOO LOW DOWN HERE. IT KIND OF RUNS INTO THE PLATE FOR THE STEERING BOX. SO CHANGE THE ANGLE A LITTLE BIT AND TRY AGAIN. WITH THE PATTERN NOW FITTING GOOD IT'S TIME TO CUT A REAL ONE FROM DOM. I'LL FIT THE SUPPORT PIECE AND DOUBLE CHECK FITMENT, AND TACK WELD IT TO THE SLEEVE ONLY AND REMOVE IT. OVER AT THE WELDING TABLE I'LL TAKE THE BUSHING OUT AND CLEAN UP THE TUBE WITH A SCOTCHBRITE PAD, AND MAKE A FEW SHORT PASSES WITH THE TIG WELDER. THEN I'LL CUT OUT THE TACK WELDS FROM THE MIG AND COMPLETELY WELD IT WITH A TIG FOR A NICE, CLEAN LOOK. THEN I'LL FINAL WELD THE ENGINE MOUNT. WHEN EVERYTHING IS NICE AND COOL THE MOTOR MOUNT BOLTS ONTO THE ENGINE, AND THE FRAME SIDE IS ATTACHED. WHEN POSITION IS FINALIZED I CAN TACK WELD THE OUTER MOUNT TO EACH SIDE OF THE FRAME, LOCKING THE NAIL HEAD IN ITS FINAL RESTING PLACE. WITH THE ENGINE LOCKED INTO PLACE, THE NEXT STEP IS TO BUILD A MOUNT FOR THE TRANSMISSION. SO I WENT AHEAD AND MADE A CROSS MEMBER FROM DOM TUBING AND A LITTLE BIT OF FLAT PLATE. IT'S BASICALLY GONNA SLIDE UNDERNEATH THE BACK OF THE TRANSMISSION AND THE TOP WILL SIT FLUSH WITH THE VERY TOP OF THE FRAME, WHICH WILL LEAVE CLEARANCE FOR THINGS LIKE EXHAUST, AND DOWN HERE IT'LL ATTACH TO A GM RUBBER MOUNT. NOW ALL IN WE'VE GOT ABOUT $75 BUCKS IN MATERIALS FOR THIS WHOLE PROJECT. SO AS LONG AS YOU HAVE THE RIGHT FABRICATION TOOLS AND A LITTLE BIT OF INGENUITY YOU CAN MOUNT NEARLY ANY ENGINE AND TRANS INTO ANY CHASSIS. (JEREMY)>> NEW FROM MATCO TOOLS ARE THESE SEALED FLAT HEAD RATCHETS WITH ROTATING THROTTLE. THIS NEW PATENTED DESIGN ALLOWS YOU TO MOVE THE THROTTLE LEVER INTO EIGHT DIFFERENT POSITIONS. SO YOU DON'T BUST YOUR KNUCKLES IN THOSE HARD TO REACH AREAS. PLUS THE LOW PROFILE FORWARD AND REVERSE ALLOWS YOU TO EASILY SWITCH DIRECTIONS WITH JUST ONE HAND. THE QUARTER INCH DRIVE FEATURES 35 POUNDS OF TORQUE, AND THE THREEEIGHTHS GOES ALL THE WAY UP TO 90. GRAB YOURS AT YOUR LOCAL MATCO TOOLS DISTRIBUTOR OR MATCO TOOLS DOT COM. (NARRATOR)>> AHEAD! ( )>> IT'S ALL CHEVYS, IT'S ALL C-10'S! (NARRATOR)>> WE HAD TO TEXAS FOR A BOW TIE LOVE FEST. (JEREMY)>> WE'RE BACK ON TRUCK TECH TAKING A LITTLE BREAK FROM THE SHOP BY TRAVELING 700 MILES TO A REALLY COOL EVENT DOWN IN FORT WORTH. ( )>> YEE HAW! (LT)>> WE'RE AT TEXAS MOTOR SPEEDWAY FOR THE LMC TRUCK C-10 NATIONALS. THE DRESS CODE HERE, STRICTLY BOW TIE. SOME GOOD LOOKING TRUCKS HERE MAN. (JEREMY)>> YEAH MAN, IT'S AWESOME! (LT)>> AND WE THOUGHT THIS WOULD BE THE PERFECT PLACE TO SHOW OFF OUR '71 PATINA TRUCK WE BUILT A WHILE BACK. (JEREMY)>> YEAH WE'VE HAD A LOT OF FUN IN THIS TRUCK. OUT RUNNING AROUND GRABBING PARTS FOR THE SHOP, TAKING IT OUT CRUISING, AND GOING TO SHOWS, AND BELIEVE IT OR NOT WE'VE ACTUALLY DONE A FEW THINGS TO IT SINCE THE LAST TIME YOU'VE SEEN IT. (LT)>> SO WE FIGURED WHAT BETTER PLACE TO BRING THIS TRUCK THAN TO TEXAS, HOME OF THE PICK UP TRUCK. SO WE WANTED TO SHOW OFF SOME OF THE HARD WORK THAT WE PUT INTO IT AND GIVE YOU GUYS A CHANCE TO ENJOY IT AS WELL. 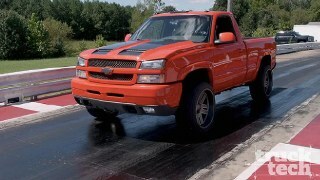 (JEREMY)>> SO WHAT IS IT ABOUT CHEVROLET'S ICONIC PICK UP? 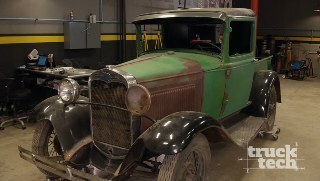 THE SOLD MILLIONS OF THEM AND NOT ONLY WERE THEY AFFORDABLE BACK THEN, BUT YOU CAN RESTORE ONE TODAY TO ITS FORMER GLORY THANKS TO COMPANIES LIKE LMC TRUCK, WHO REMAN AND OFFER JUST ABOUT EVERY KNOB, BODY PANEL, AND TRIM PIECE. (BECKY)>> WE'VE PUT A LOT OF EFFORT INTO THIS SHOW AND IT'S GONE GREAT. I'M AMAZED BY THE TURNOUT TODAY AND ALL THE TRUCKS. IT'S VERY GRATIFYING. IT MAKES ME VERY HAPPY TO WALK AROUND, HEAR ALL THE STORIES THAT I'VE HEARD, AND HOW FAR PEOPLE HAVE COME. THERE ARE PEOPLE THAT HAVE COME FROM CANADA TO THIS SHOW, AND THEY HAVE FLIERS IN THEIR BOXES THAT WE SENT THEM. (CHRIS)>> WE WERE TRYING TO DECIDE WHERE TO HAVE THIS EVENT. YOU'VE GOT TO HAVE IT IN TEXAS. TEXAS IS THE PICK UP TRUCK CAPITAL, I THINK, OF THE COUNTRY AND PROBABLY OF THE WORLD. THERE'S NO BETTER PLACE TO HOLD AN EVENT LIKE THIS THAN TEXAS MOTOR SPEEDWAY. (JEREMY)>> NOW FOR YOU GUYS THAT ARE USED TO GOING TO TRUCK SHOWS, IF YOU WIN AN AWARD YOU'RE PROBABLY GONNA TAKE HOME SOME TYPE OF PLASTIC TROPHY AND PROBABLY THROW IT AWAY, BUT HERE AT THE C-10 NATIONALS YOU'RE NOT GONNA DO THAT BECAUSE IF YOU WIN A BEST OF PAINT, BEST INTERIOR, BEST DESIGN AWARD YOU'RE GONNA WIN A SMALLER VERSION OF A TROPHY LIKE THIS, BUT IF YOU WIN THE C-10 NATIONALS C-10 TRUCK OF THE YEAR THIS IS THE BAD BOY YOU'RE TAKING HOME. A HAND FABRICATED TROPHY FROM RECLAIMED NASCAR PARTS. IT DOES NOT GET MUCH COOLER THAN THIS. AND CERTAINLY A CONTENDER FOR BEST PAINT IS THIS MASTERPIECE BY MAXWELL AUTO DESIGN. LOTS OF VISUAL TRICKS HAPPENING HERE THAT MAKE YOUR EYEBALLS THINK IT'S MADE OF PATCHED TOGETHER STAMPED METAL. ANY OF YOU GUYS THAT KNOW ME, YOU KNOW I LOVE CUSTOM PAINT, WHETHER I'M DOING IT OR SOMETHING CATCHES MY EYE, LIKE THIS 1965 C-10. THIS THING HAS ABOUT 500 HOURS INVESTED IN PAINT ALONE, AND IF YOU WANT TO TALK ABOUT SOME SERIOUS DETAIL THIS ONE'S GOT IT. AS YOU WALK BACK AND FOLLOW THE FLAMES THIS IS AN EFFECT WE CALL A FADE. IT STARTS WITH A YELLOW, TRANSITIONS TO AN ORANGE, ALL THE WAY BACK TO A BLOOD RED, PRETTY COOL! LOOK AT THE SHADOWING ALONGSIDE THE FLAMES WITH THE PIN STRIPE, AND THESE RIVETS. THAT TAKES A LOT OF HOURS TO DO. ALL OF THE BREAK POINTS BUT WHAT'S REALLY COOL IS THIS EFFECT RIGHT HERE. HE ACTUALLY USES SHAVING CREAM TO GET THIS. YOU APPLY THE SHAVING CREAM OVER A BASE COAT, APPLY A DARKER COLOR OVER IT. THEN YOU WIPE THE SHAVING CREAM AWAY AND THAT'S WHAT YOU GET. HOW COOL IS THAT? (NARRATOR)>> NEXT YOU'LL SEE SOME COOL CUSTOMS CHEVY NEVER BUILT. (JEREMY)>> DENTED CAB, SQUARE BODY. THIS IS A VERY RARE TRUCK. (LT)>> ONE OF MY ABSOLUTE FAVORITE TYPES OF VEHICLE IS A SLEEPER. SOMETHING THAT FROM THE OUTSIDE LOOKS STOCK, IS VERY ASSUMING, BUT IT'S A WOLF IN SHEEP'S CLOTHING. ONCE YOU POP THE HOOD YOU REALIZE IT'S PACKING A PRETTY SERIOUS PUNCH. (ERIC)>> MY NAME'S ERIC, I'M FROM FORT WORTH TEXAS, AND THIS IS MY '78 C-10 SUBURBAN. I FOUND THIS TRUCK IN EAST TEXAS 10 MINUTES FROM MY PARENTS HOUSE. IT'S ORIGINAL PAINT, 73,000 ORIGINAL MILES. WE BOUGHT THE TRUCK. IT RAN GREAT BUT WE WANTED MORE. SO WE CHANGED THE ENGINE. IT'S A 370 CUBIC INCH FORGE LSX ENGINE WITH A LITTLE TURBO. THE TURBO IS AN S-43. RIGHT NOW IT'S ON 13 POUNDS OF BOOST. WE PLAN TO ADD MORE SPRING TO IT AND TURN IT UP. THE GOAL IS REALLY TO MAKE 1,000 HORSEPOWER. (LT)>> WHAT'S IT PUSHING OUT RIGHT NOW? (ERIC)>> RIGHT NOW SHE'S MAKING 730 AT THE WHEELS. A LOT OF TIME WHEN I POP THE HOOD IT'S UNSUSPECTING UNTIL SOMEBODY WALKS UP, TAKES A LOOK DOWN IN THE ENGINE BAY, AND THEN IT KIND OF BLOWS MINDS AND IT REALLY MAKES YOUR HEART TREMBLE WHEN YOU UNDERSTAND HOW MUCH POWER THAT THING REALLY MAKES. WHEN WE DID THE DRIVETRAIN SWAP WE HAD THE FENDERS OUT JUST TO FRESHEN THEM UP AND WE HAD SOME MATERIAL THAT WAS A COOL PLAID, AND WE JUST TOOK A HIGH RES PHOTO, PRINTED THAT ON VINYL, AND WRAP THE INNER FENDERS JUST TO GIVE IT A LITTLE BIT OF EXTRA FLARE. (LT)>> TO GET A BETTER APPRECIATION FOR THE VARIETY OF BUILDS HERE WE'RE GONNA TAKE A CLOSER LOOK AT THE WIDE RANGE OF TRUCKS THAT ARE PRESENT AT THE SHOW. 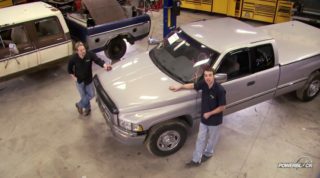 (JEREMY)>> NOW WHEN YOU THINK OF A C-10 THE FIRST THING THAT COMES TO MIND IS THE SQUARE BODY, AND THE MOST POPULAR CONFIGURATION OF THIS TRUCK IS THE STANDARD SHORT WHEEL BASE. NOW THESE TRUCKS HAVE GAINED SO MUCH IN POPULARITY DUE TO THE FACT THEY'RE SO SPORTY, BUT IT DOESN'T MATTER HOW YOU BUILD IT. WHETHER YOU SLAM IT DOWN ON THE GROUND OR IF YOU LIFT IT UP IN THE AIR. NO MATTER WHAT DRIVETRAIN YOU PUT IN IT. NO MATTER WHAT YOU DO THIS TRUCK'S STILL GONNA BE REALLY COOL. (LT)>> WHEN IT COMES TO CHOOSING AN ENGINE FOR YOUR CHEVY PICK UP THE GM LS FAMILY IS BY FAR THE MOST POPULAR OPTION TODAY. 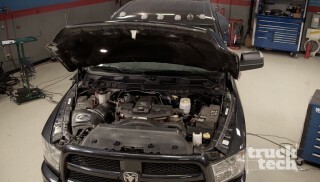 MOST GUYS WILL START THEIR LS SWAP WITH THE BASIC FIVE POINT THREE LMSEVEN PULL OUT, AND SOME WILL STEP UP TO ITS LARGER MORE POWERFUL BROTHER, THE SIX LITER LQFOUR OR LQNINE. 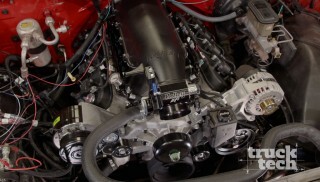 THE SIX POINT TWO LITER LS THREE IS AN EVEN MORE POWERFUL OPTION AS IT CAME IN AT OVER 400 HORSE. 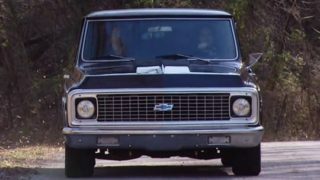 SOME GUYS ARE STILL KEEPING THE OLD SCHOOL SMALL BLOCK CHEVY ALIVE, AND A FEW ARE STILL ROCKING THE BIG BLOCK CHEVY, AND GM'S NEWEST OFFERING, THE DIRECT INJECTED LT ONE WAS EVEN FOUND UNDER THE HOODS OF A FEW TRUCKS. SO EVEN THOUGH THE C-10 SHORT BOX IS PROBABLY THE MOST POPULAR VERSION OF THE TRUCK THAT'S OUT HERE TODAY GM MADE A WHOLE RANGE OF TRUCKS AND THIS IS THE COMPLETE OPPOSITE END OF THE SPECTRUM. THIS IS A 1982 K-30 THREE PLUS THREE DUALLY. NOW HERE'S WHAT ALL THAT MEANS. K-30 MEANS IT'S A ONE TON. THREE PLUS THREE MEANS THERE ARE TWO ROWS OF SEATS THAT EACH SEAT THREE PEOPLE, AND IT'S A DUALLY WITH AN EIGHT FOOT BED. SO IF YOU NEEDED TO MOVE A LOT OF WEIGHT IN 1982 THIS IS PROBABLY THE TRUCK THAT YOU WOULD GET. NOW YOU COULD ALSO GET FULL SIZE BLAZERS, SUBURBANS, BOTH IN TWO AND FOUR WHEEL DRIVE. 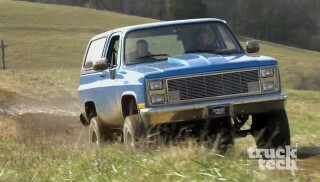 NOW THAT'S ONE OF THE REASONS WHY THE SQUARE BODY IS ONE OF THE MOST POPULAR GM TRUCKS OUT HERE TODAY. EVERY GENERATION OF CHEVY TRUCK WAS WELL REPRESENTED HERE IN TEXAS, STARING BACK IN THE '50'S WITH THIS CLEAN CUSTOM. THE '60 TO '66 FAMILY, LIKE THIS OVER THE TOP BUILD WITH HEAVY METALLIC PAINT AND A CUSTOM BED FLOOR. THEN OF COURSE YOU HAVE THE EVER POPULAR '67 TO '72'S. FOLLOWED UP BY THE '73 TO '80'S, LIKE THIS CLEAN STEP SIDE K-10. AND OF COURSE YOU CAN'T FORGET ABOUT THE '81 TO '87'S. AND THERE WERE EVEN A FEW SQUARE BODIES FROM '91, LIKE THIS SLAMMED GMC SUBURBAN AND FACTORY ORIGINAL BLAZER. (JEREMY)>> NOW OTHER THAN THE TRUCKS GM OFFERED ON THE SHOWROOM FLOOR THERE ARE SOME ODDBALLS OUT HERE, LIKE THIS EXTENDED CAB SQUARE BODY. THIS IS A VERY RARE TRUCK. NOW GM DID NOT BUILD THESE. THIS WAS ACTUALLY A CONVERSION THAT A FEW OTHER COMPANIES OFFERED, BUT GM DID CERTIFY THEM. WHAT THEY DID WAS THEY KEPT THE WHEEL BASE THE SAME. THEY TOOK A LONG BED AND THEY CUT 18 INCHES OUT OF IT. THEY ACTUALLY USED SOME OF THOSE PARTS INSIDE THE CAB. SO IN THIS PORTION OF THE CAB THERE'S ACTUALLY BED FLOOR IN THERE. NEEDLESS TO SAY THIS IS A VERY, VERY RARE TRUCK, BUT THIS IS NOT THE ONLY TRUCK OUT HERE THAT GM DIDN'T BUILD, LIKE THIS FOUR DOOR SHORT BED PICK UP TRUCK MADE FROM MIXED AND MATCHED OEM PARTS. A LITTLE BIT OF A RAKE TO IT AND THE WHEELS, DIDN'T DO ANYTHING CRAZY. DID JUST 20 BY NINES ALL THE WAY AROUND. SO DIDN'T GO NUTS THERE. (LT)>> WE DID A FEW UPGRADES TO THE SHOP TRUCK, LIKE A COLOR MATCHED SPRAY ON BED LINER, AND RELOCATED THE AIR MANAGEMENT FROM THE BED TO THE FRAME. (JEREMY)>> AND WHILE WE WERE HERE WE COULDN'T PASS UP A CHANCE AT A FEW LAPS ON THE ONE POINT FIVE MILE OVAL. WITH ITS 20 DEGREE BANKING IN TURNS ONE AND TWO AND 24 DEGREES IN THREE AND FOUR. (LT)>> I'LL TELL YOU WHAT. THAT'S AN INCREDIBLE EXPERIENCE TO GET TO DRIVE A TRUCK OUT ON A REAL LIFE NASCAR TRACK. WE ARE STOKED! (JEREMY)>> NOW YOU DON'T GET TO DO THAT EVERY DAY. IT WAS FUN TO OPEN HER UP AND NOT GET A TICKET. LT AND I BOTH HAVE OUR FAVORITES HERE AT THE LMC TRUCK C-10 NATIONALS, LIKE THIS RARE AND BEAUTIFULLY RESTORED '72 KFIVE BLAZER, BUT TO TAKE HOME A TROPHY YOU'VE GOT TO IMPRESS THE JUDGES. REMEMBER PATRICK MAXWELL'S RIVETED WONDER? HE TOOK HOME THE PRIZE FOR BEST PAINT. AND TRUCK OF THE YEAR WENT TO GEORGE SEPULVEDA AND HIS BUILDER ROSS LOGSTON FOR THEIR '57 STEP SIDE. 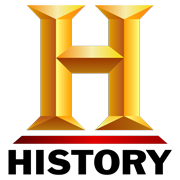 REMEMBER, POWERNATION TV DOT COM IS WHERE YOU GO FOR ANYTHING YOU'VE SEEN ON OUR SHOW. ADIOS FROM TEXAS!